We don't typically consider a 16-core Core i9 or 16-core Threadripper chip as CPUs for gamers, but in reality, a lot of people with high-end hardware play games. 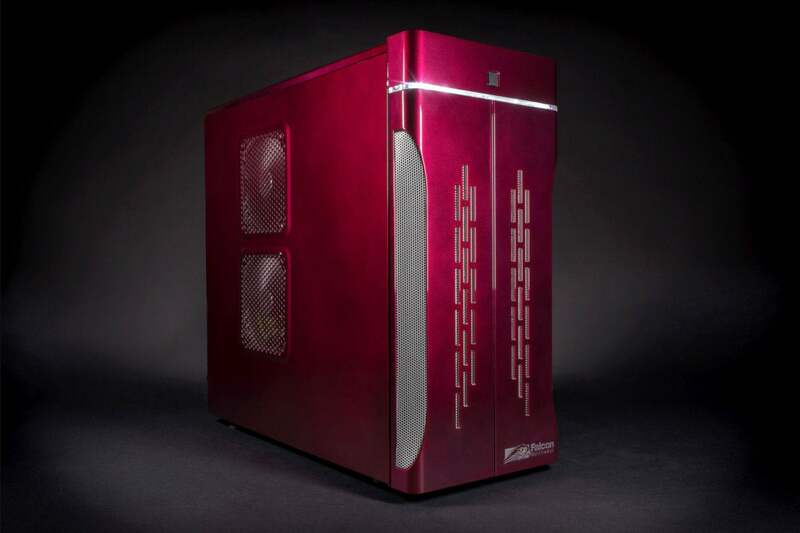 Given that both rigs are configured with a pair of Titan Xp cards, we simply have to test these machines in gaming. Note that we ran the Threadripper using the latest version of Ryzen Master in Game Mode and in Creator Mode (which you can read about here in our original review of Threadripper.) The best score for each test was reported. First up is Futuremark's 3DMark Time Spy test. It's the company's latest DirectX12 benchmark. Because we care only about CPU performance, we're reporting only the CPU subscore. Cleary, the test likes Core i9 more. 3DMark Time Spy also gives the nod to Intel. 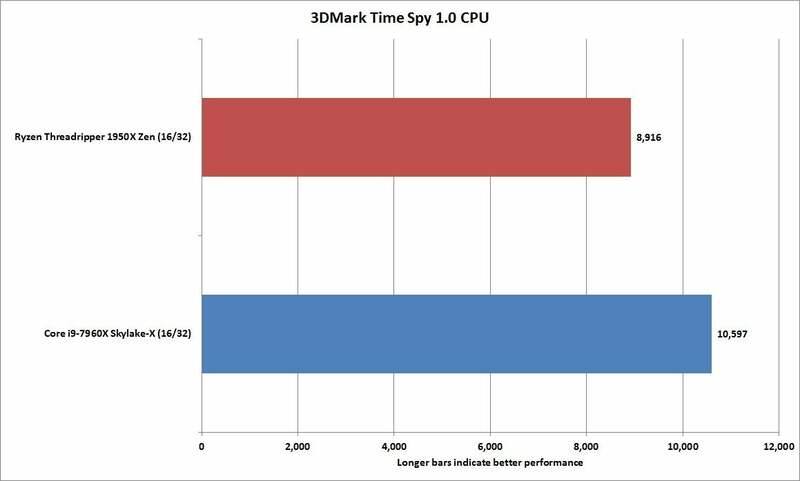 Futuremark has been hard at work creating an Extreme version of its new DirectX12 benchmark. Luckily, we had it in time to run on our pair of Falcon PCs. 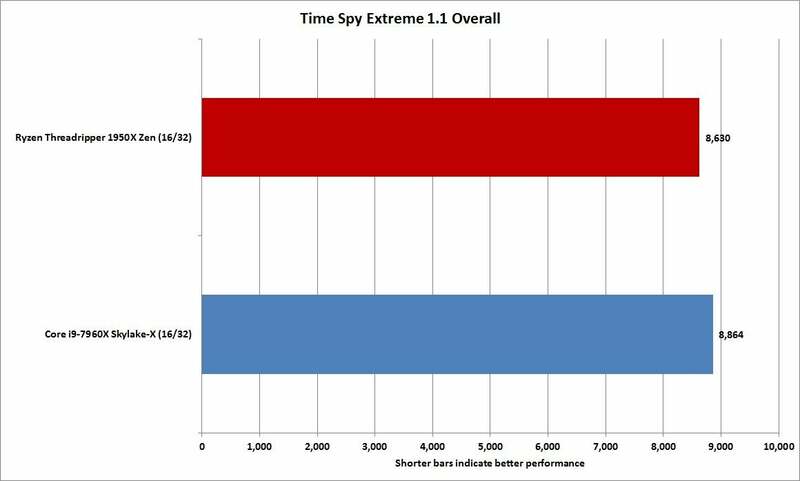 Here's how nearly identical PCs perform in the brand new 3DMark Time Spy Extreme 1.1. The overall score itself was basically a tie, with the Core i9 box hitting 8,864 and the Threadripper box scoring 8,630. 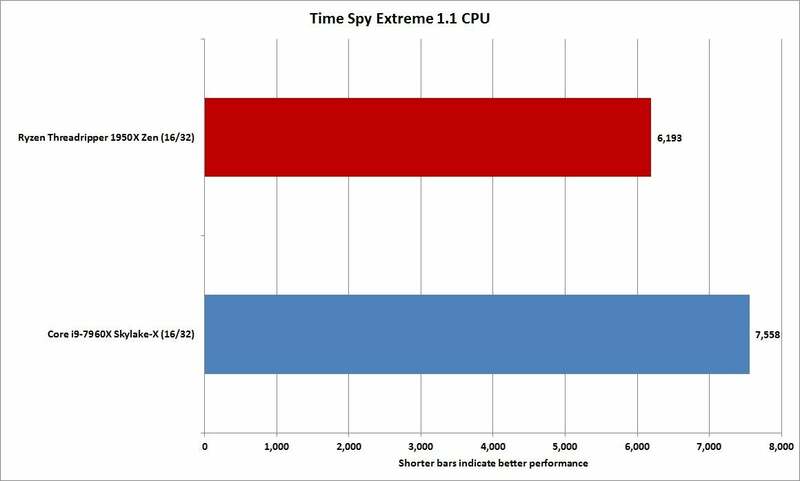 If you dig into the sub-score focusing on the CPU, though, the Core i9 again has a performance edge by about 20 percent. Why? That's hard to say. It's unlikely this is all a clock speed advantage. The newly released 3DMark Time Spy Extreme 1.1 favors Intel in its CPU test. The next step is to see how this translates into real games at real resolutions. We ran several off-the-shelf games on their highest visual quality settings at 4K resolution. There's no 1920x1080 at Medium nonsense here: It's all about playing with the pair of Titan Xp cards maxed out. As we noted previously, we ran the tests in both Game Mode and Creator Mode on the Threadripper system, and we used the highest score obtained in either mode. For Middle-earth: Shadow of Mordor, though, it didn't matter. Both of Threadripper's modes produced the same performance. 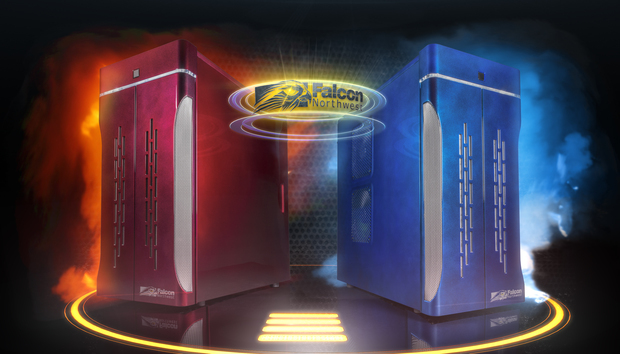 And yes, for the most part, even with a pair of Titan Xp cards in SLI, both Falcon machines are tied. 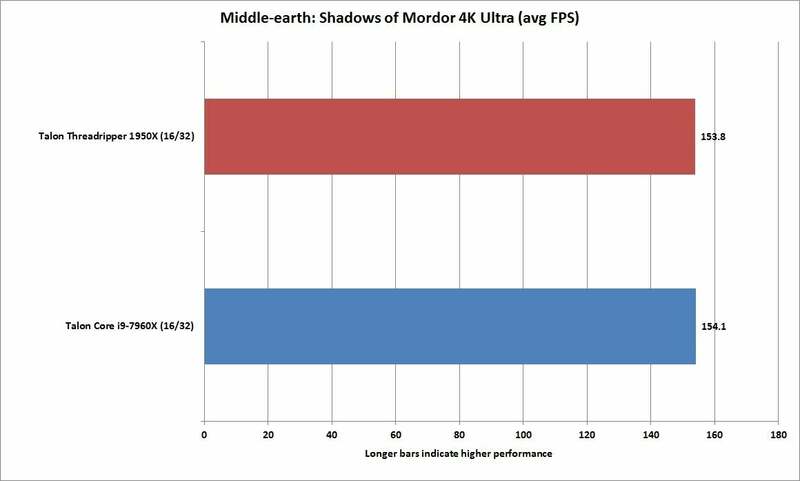 Both machines are pretty much tied in Middle-earth: Shadow of Mordor run at 4K resolution on the Ultra quality setting. Our next test was Rise of the Tomb Raider. 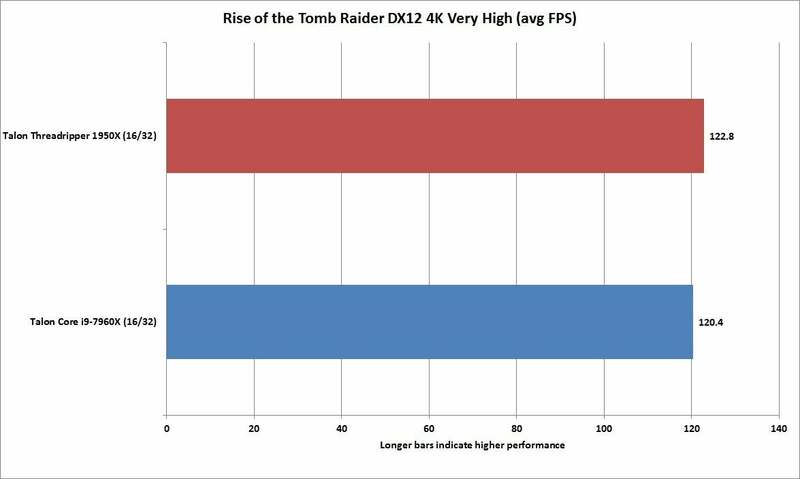 AMD made much hay of Rise of the Tomb Raider's patch, which helped close Ryzen's performance gap compared to Intel chips. The problem, AMD said, was old code that just didn't know how to deal with Threadripper. For our tests, we ran at 4K resolution on the Very High preset and in DirectX 12 mode. 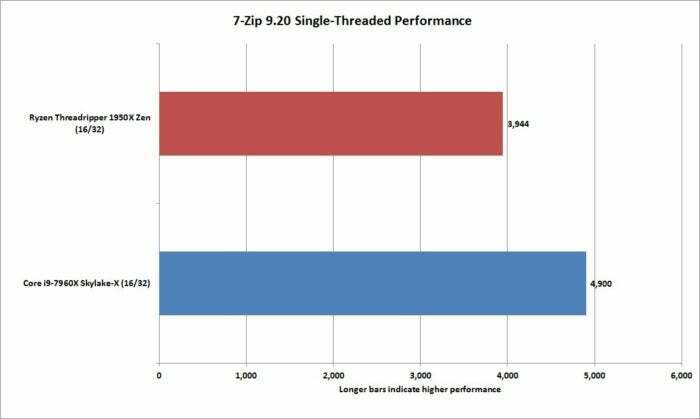 Threadripper is a frame or so faster, but for most part—it's a tie. In Rise of the Tomb Raider, a much-ballyhooed patch puts Ryzen Threadripper right in step with Core i9. 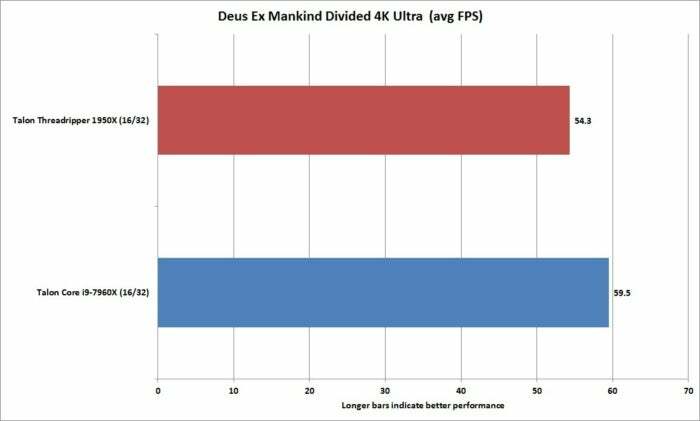 Deus Ex: Mankind Divided is another test that AMD really loved when Ryzen 7 first shipped because, well, it runs pretty well on AMD CPUs. For our test, we ran Mankind Divided on the Ultra setting and 4K resolution. 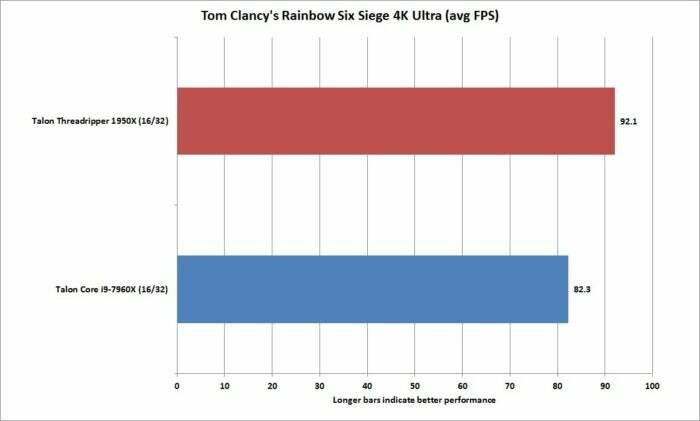 The result from a gaming perspective is disappointing, as both machines could barely reach 60 fps even with two Titan Xp GPUs and high-end CPUs. 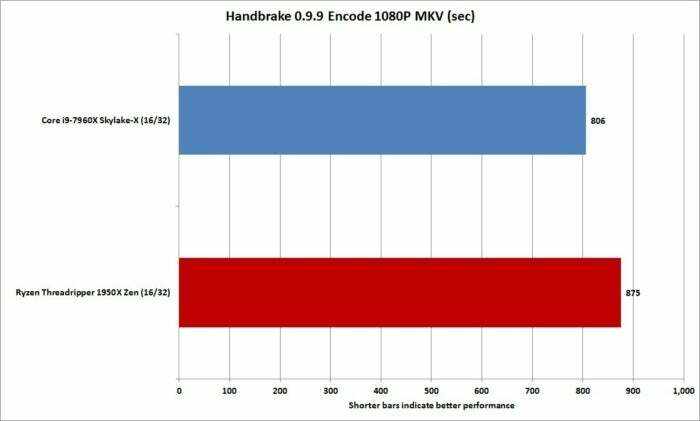 More importantly, the Core i9 has a slight edge in frame rate. The performance of Threadripper was the same between Game Mode and Creator Mode. Core i9 has a slight edge in Deus Ex Mankind Divided. So far the balance in gaming has been a tie or in favor of Intel, but that flips once we get to Tom Clancy's Rainbow Six Siege, which we ran at 4K resolution and on the Ultra quality setting. 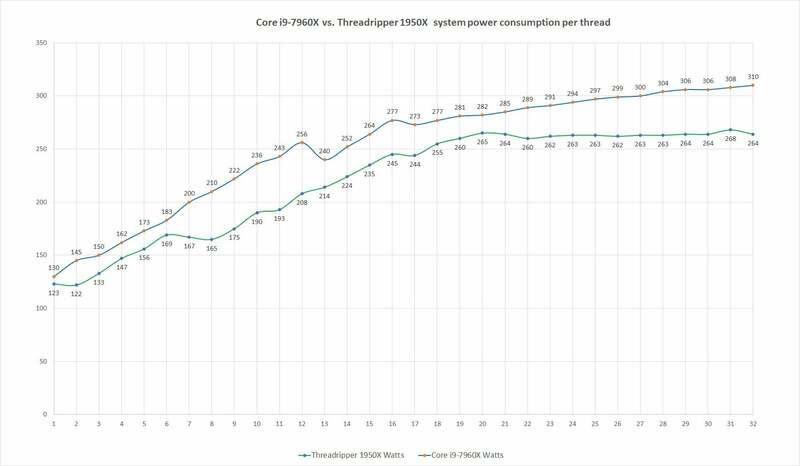 The Threadripper Talon system comes out on top by a very decent amount. Its score was achieved with it set to Game Mode, but when set to Creator Mode, it wasn't that far off. 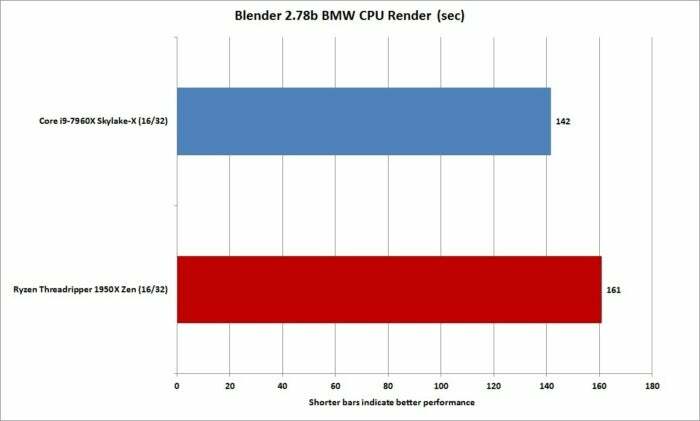 In one of the rarer wins for Threadripper, it comes out a solid 10 fps faster than the Core i9 machine. Our last gaming test is Stardock's Ashes of the Singularity: Escalation. 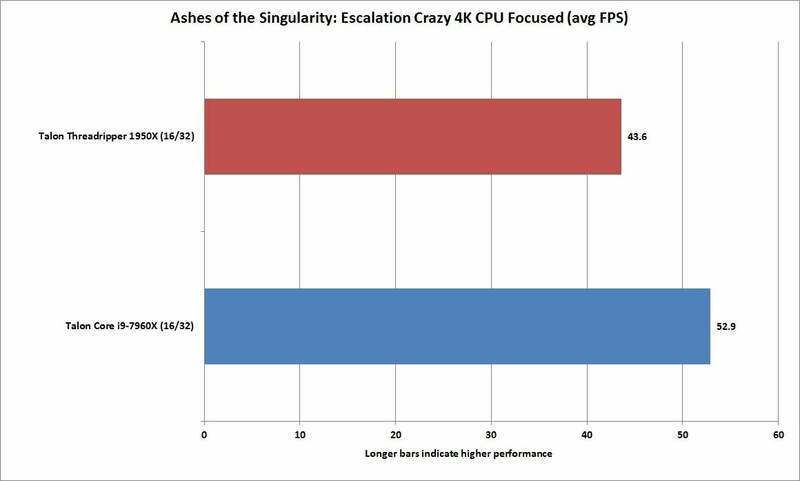 We ran the test at 4K using the Crazy preset and the CPU Focused setting to test the CPU, rather than in the GPU Focused mode. Ashes of the Singularity: Escalation appears to favor Intel. We usually shy away from power consumption comparisons because they can be blown out of proportion. In a desktop PC with multiple drives and a graphics card, the CPU isn't the power hog, it's the graphic card. The second reason is the difficulty measuring power consumption between different systems. But hey, here we are with nearly duplicate systems, so we plugged the Northwest Talon PCs into Watts Up Pro meters and measured the total power consumption under different CPU-only loads. 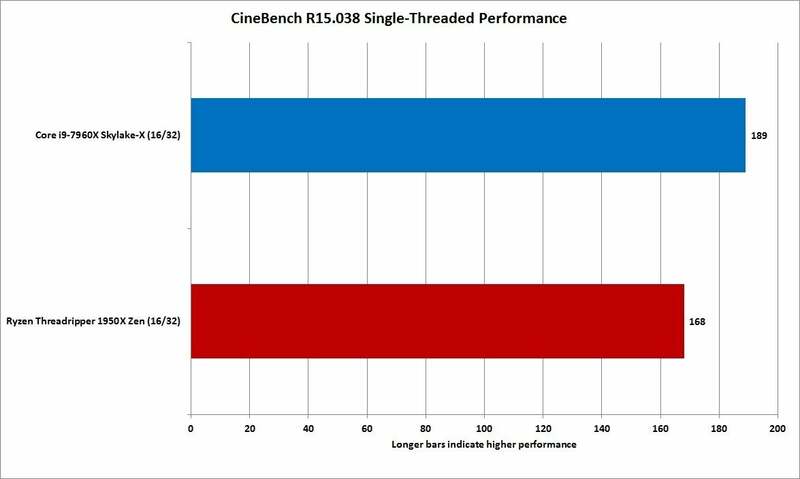 Using Cinebench R15 to push the systems from 1 thread to 32 threads, it was clear which CPU was the winner. What's also interesting is to see how Threadripper's power consumption levels off once it hits about a 16-thread load. Core i9 just continues to ramp up power consumption as you increase the load. And mind you—this is stock clocked. Vendors have told us they've seen Core i9 consume more than 500 watts under heavy overclocking. You can see the power consumption of Threadripper level off, while Core i9 just keeps climbing for the stars. One question many people have asked is just where Core i9 gets all of its performance. 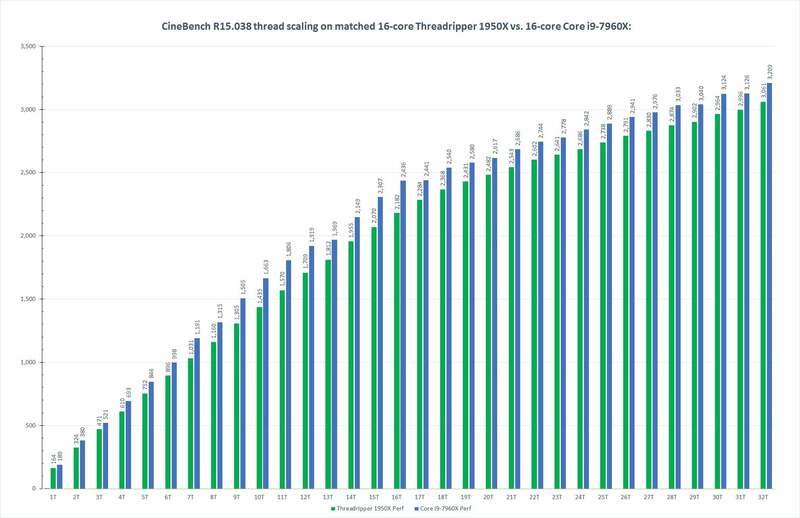 For the most part, Core i9 is a modified Skylake core, which means that in Instructions Per Cycle, it's not that far ahead of the cores in the Threadripper chip. The main difference is likely its clock advantage. We again took Cinebench R15 and varied the workload from 1 thread to 32 threads, recording the clock speeds using the respective Intel or AMD utilities (XTU and Ryzen Master). The chart below shows the Core i9 with a minimum of 200MHz clock speed advantage on loads up to 13 threads or so. Beyond that, Threadripper actually has the advantage by about 100MHz. 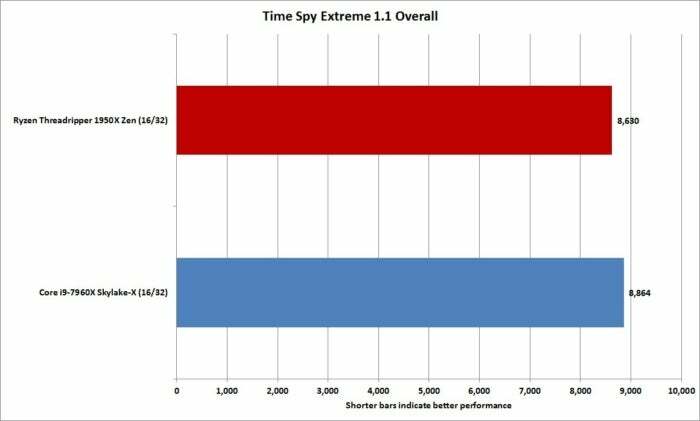 You can see where much of the improvement for Core i9 comes from on the low-end: clock speed. 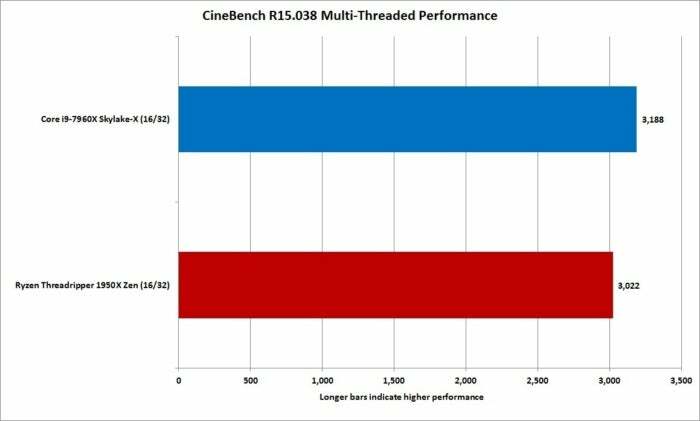 To see how that clock speed advantage plays out, we again use Cinebench R15 to vary the workload from 1T to 32T and record the final score. Core i9 leads the way the entire time. 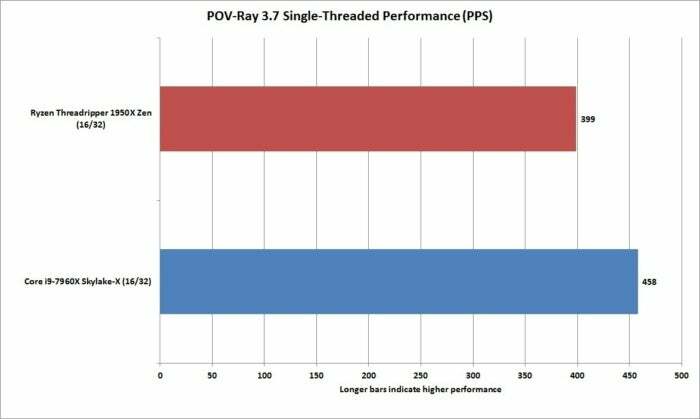 Core i9 has the performance advantage in light loads and also heavy loads. One thing the above chart doesn't get across is the actual advantage the Core i9 has on lightly threaded tasks, so we calculated the percent difference between the two. The green bars below show the Core i9 has pretty much a double-digit performance advantage on lightly threaded tasks up to about 16 threads. 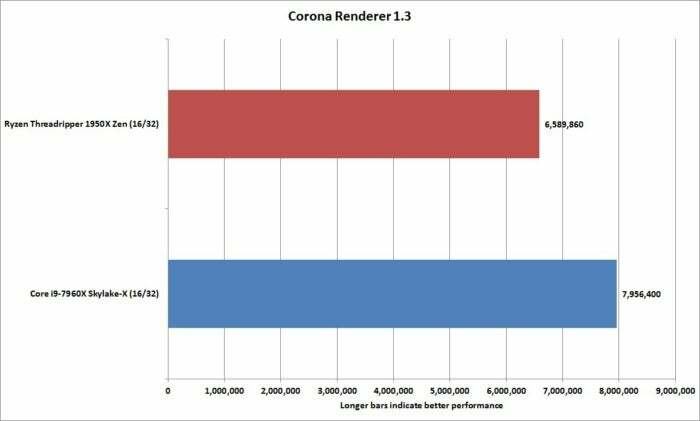 Our Cinebench chart doesn't quite show the performance advantage the Core i9 has at light loads, but this clearly shows a very healthy double-digit performance at light-duty loads for Core i9, and a five-percent advantage on multi-threaded tasks. AMD fans have been biting their tongues this whole time, and here's why: Our 16-core vs. 16-core contest ignores the key difference between Core i9-7960X and Threadripper 1950X. AMD charges $1,000 for the Threadripper 1950X, while Intel charges $1,700 for the Core i9-7960X. In builder's terms, that difference is equivalent to a motherboard and a decent SSD. 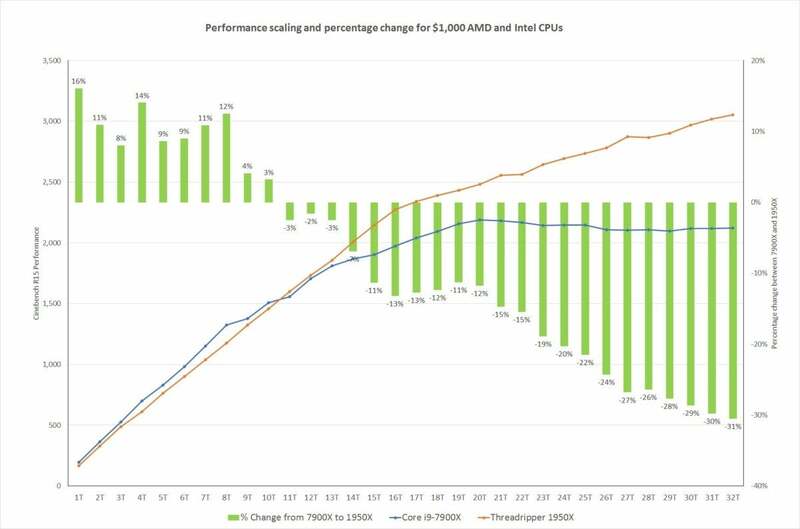 If we had decided to do this contest based on CPU pricing, it really would be the 16-core Threadripper 1950X vs. the 10-core Core i9-7960X. That flips the entire conversation, as you can see in the 16-core vs. 10-core battle we did when we originally reviewed Threadripper 1950X. The chart below shows the performance advantage the 10-core Core i9-7900X has at the low end, but once you cross over to about 10 threads, Threadripper's 16 cores takes over and you're looking at up to a 31-percent performance deficit for that Core i9 chip. The secret to Threadripper is its cost. 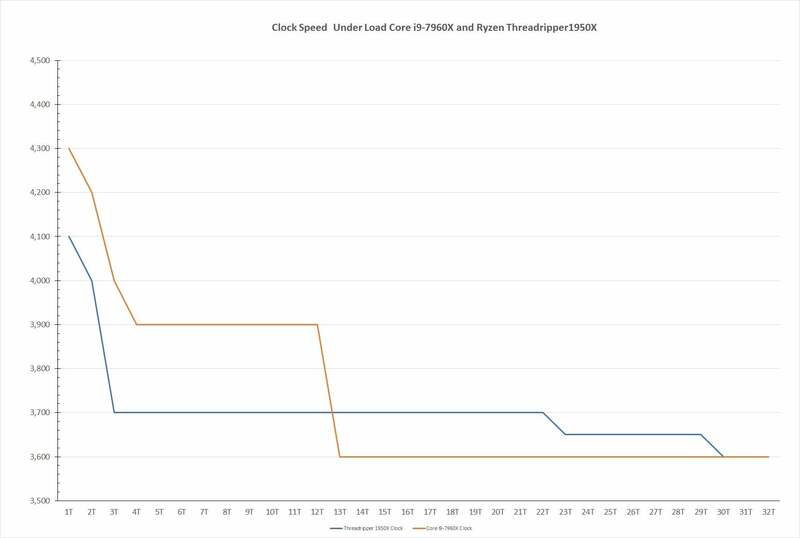 You can see where the 16-core Threadripper 1950X rips the 10-core Core i9-7900X to pieces despite being the same price. One last thing to consider is that the price of just the CPU isn't everything. 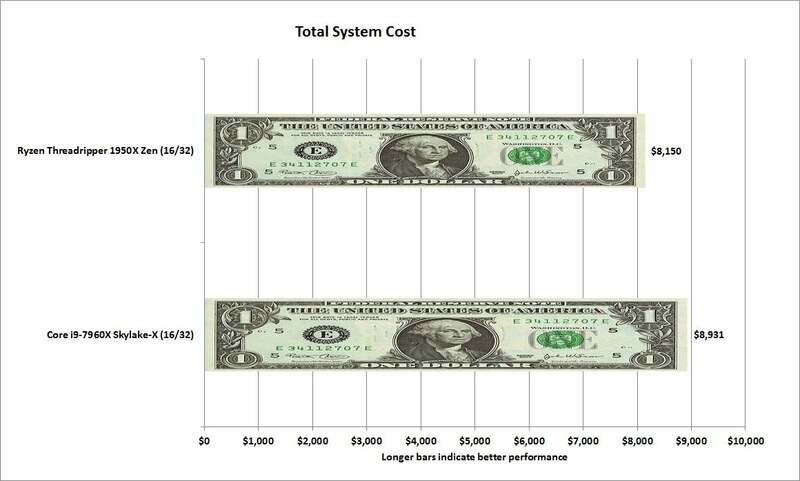 When it's watered down by the total cost of the system, it may indeed be worth it for some. 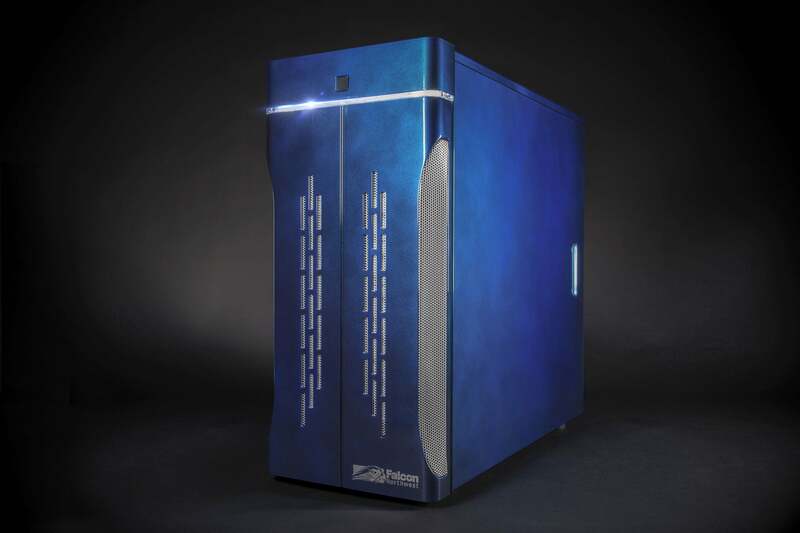 For example, the Falcon Northwest Talon systems that we used were both dream configurations with $2,400 in GPUs, maybe $1,800 in RAM and $1,200 in SSDs. That doesn't count the motherboard, hard drive, cooling, case, power supply or custom hand-paint jobs. When you're building a box in this range, the price difference in the CPU isn't that much. Of course, not everyone buys loaded machines like the Falcons. If your machine budget is closer to $3,500, then the $700 you save on a Threadripper represents a much larger part of the budget. The $700 probably seems excessive—unless you're looking at an uber-expensive box such as either of the Falcon Northwest Talon PCs. Looked at in a core-vs.-core battle without considering price, Intel's Core i9-7960X leads the way. It gives you great performance at light-duty applications and generally can't be touched by the Threadripper 1950X in heavy-duty applications, either. 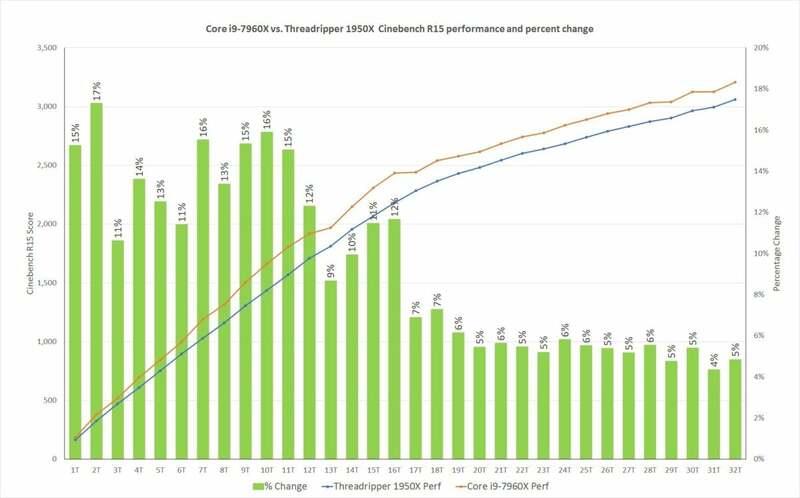 In a lot of the tests we ran, we were actually surprised Core i9 ran away from Threadripper so easily. That said, it's pretty hard to ignore price when you're spending your own money on a build. Our opinion hasn't changed for Threadripper: It is absolutely the best $1,000 CPU you can get, a spectacular deal. But price aside, in a 16-vs.-16 battle, Core i9 is the winner.